During two summers when I was in college, I worked on a Sod Farm. It was, let’s say, a developmental experience. The days were hot, long, and often included nothing more than sitting on a tractor listening to the diesel drone as I would slowly mow the sod at 1.8 mph (2.9 kph). While I would often recite the dialogue of Sgt. Bilko in my head to pass the time, I did manage to develop a deep fascination for the machinery used. Two months ago, Eurobricks decided to hold a contest to create three Technic creations that would work together. After some thought about the rules, the parts I had, I thought I could create an entry, and offer something a little unique. The full gallery may be found here, and instructions here. The contest required three models that would work together in a particular setting. Each must have a part count that did not exceed 500 parts, and each had to be unique. While trailers were acceptable, I somehow felt offering an entry with a trailer did not allow for enough creativity. As my thoughts wondered on a bike ride, I decided I would create a small truck, a little forklift, and a sod harvester. My design would harken back to those days on the sod farm. Rather than the Freightliner Columbia and Piggyback Forklift we used, I designed a MAN TGS and a JCB 150T to have little more international flair, and frankly, to have a little more color. We used a Brouwer SH 1576 to harvest the sod, so I thought I should keep that machine. The MAN TGS went through a number of revisions. Each was done to reach the part limit. The final MOC ended with a three function knuckleboom crane and a simple bed. 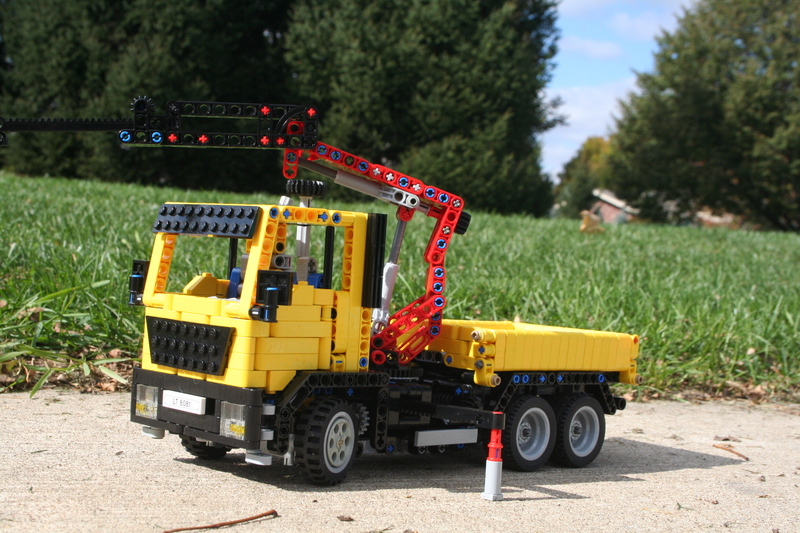 In addition to the steering and the working doors, the crane is fully functional. The rotation is handled by a wheel on the right of the truck, and the main lift is handled by a wheel in the rear of the truck. The second stage lift and boom extension is handled by a small wheel at the top of the crane. The JCB 150T was a simple and straightforward build. Recreating a MOC with a single arm lift created some additional challenges. A single mini linear actuator was used to lift the boom, and a worm gear system was used to adjust the tilt of the forks. The offset cabin caused some frustration, but I eventually figured it out. Finally, the Brouwer SH 1576 was the purpose of this project. After a little research, I determined the scale of the project. I then started building. I usually add too many features to a MOC, and this harvester was no exception. The rear wheels spun a single differential, which ran straight to the front to power a two cylinder motor. Off the driveline was a PTO between the motor and the differential which would run the harvesting arm. The harvesting arm has a track system to drive the pieces of sod up to the back of the harvester to load the sod on the pallets. A simple cutting head was added to the front which had a cutter to cut the sod off the ground, and a timed cutter on the top to make sure each piece of sod was the correct size. After some work I added a simple steering system controlled by the smoke stack. Finally, I added a forklift system to hold and drop the pallets of sod off the back, and a small standing pad for the pallet worker. This was the first LEGO contest I have entered since 1994. I hope you enjoy my entry. Thanks to Eurobricks.com for the contest. I appreciate your vote at eurobricks.com. In addition, instructions for the models can be found here.